We make custom cables to meet your WiFi WLAN/Radio/GPS applications needs! It's faster, easier and more affordable! Lowest Market Prices! Reverse Polarity, BNC, mini-UHF, FME, MC, MMCX etc. Male or Female Connectors? or Reverse Polarity (RP Connectors)- Plug or Jack? Connector(s) NOT available for certain cable type(s) ? Which Cable Do I need?? Outrageous Shipping and Handling Charges? Not our intention! -We will refund! Pricing Details << Prices are under each lengths of cable. Which Cable do I need? Specs Handling They are NOT Cheap but we sell them at the Lowest Market Prices!! Also see LMR cable explanation below. Adapters - if certain connectors are NOT available for some cable types, please consider using an adapter together with available cable connectors to achieve the connection. Our high-quality flexible low-loss RG58 (RG-58/U) cable is equivalent to CommScope® and Altelicon™ 195 series, and Andrews similar products - it has a solid copper wire in the center, and both a braid and foil outer conductor for superior shielding, which is BETTER than most standard RG58 RG-58U and WBC195/LMR-195 cables. - This high quality ultra-low-loss 400-series cable has excellent low loss characteristics and a durable UV protected black polyethylene jacket; it features equal performance and mechanical characteristics to similar cables from Times Microwave Systems®, Belden and Andrew® ... See its Signal Loss below. This ultra-low-loss cable is a high performance alternative to RG-8, TMS Times Microwave Systems® LMR-400, Belden® 9914 / 9913 / 7810 and Andrew® CNT-400 coax cable. 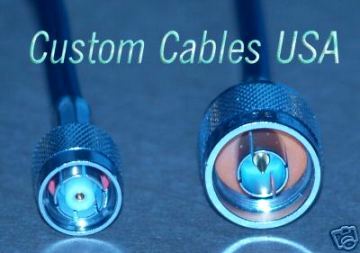 Custom Cables USA has available fully tested custom cable assemblies featuring this 400-series cable. Styles available: including Plenum rated to comply with stringent building codes, LMR400UltraFlex cable and LMR195 White cable. Order online easily! See more below. LMR® Standard is a UV resistant polyethylene (PE) jacketed cable designed for 20 years service outdoor use. The bending and handling characteristics are significantly better than air dielectric and corrugated hard line cables. Quite important is the fact that this cable uses a PE (Polyethylene) outer jacket which is highly abrasion resistant, as compared to PVC which is not nearly as durable. This product is direct buriable and PE is non-contaminating to its dielectric or to other cables it is bundled with. LMR® Flexible Low Loss Cable e.g. Times LMR-100A, LMR100A, Times LMR-195A, LMR195A, LMR-200, LMR200, LMR-240, LMR240, Times LMR-400, LMR400, 400 UltraFlex (UF) grade, and LMR-600 LMR600, etc. Our view on different brands**: A few companies make LMR® (or WBC™, CA- etc.) equivalent cables / connectors nowadays; Times Microwave Systems may have the original design, and their cables are of high quality; however, just similar to the question of “generic drugs VS brand name drugs”, if you ask us which brand of cables or connectors to buy, it is our recommendation that ...Read More on Brand comparison. Plenum cable must be used based upon the electrical code in in your area. To see a diagram explaining what a Plenum area is click the link. Plenum rated cable is much more expensive than regular cable. We can make low loss coaxial cables (assemblies) to fit/work with your WLAN/LAN D-Link, Linksys, Netgear, Belkin, Buffalo, Proxim, Belkin, Cisco, Compaq, Dell, EnGenius, IBM, Intel, Motorola, SMC, 3Com, Apple, Blitzz, Orinoco, ... and various providers' wireless network Access Points, Routers, Wireless Bridges, PCI Cards, Adapters, or PC cards; and even for Radio and GPS use. Signal loss for our 10- foot RG-58 cable is about 1.9 db, and 3.8 db with a 20-foot. Our LMR-400 equivalent cable: effective loss over 20 feet is about 1.3 db, which is trivial. From 2 inch to 250+ ft in length -- all at affordable Lowest Market prices! All of our RF/Microwave Coax cable assemblies are professionally installed by well-qualified engineers with high-quality specialized crimp tools and crimp and/or solder connectors; and over 700 customers in various industries around the globe have used our cables or connector/adapter/antenna products with satisfaction. Generally, our products are tested before shipped to customers. **Recommendations are given on a best-effort basis, and are not certified or guaranteed; we will assist you at all times to help you achieve better results at the lowest cost possible, but customers are responsible for their own decisions - Terms and Conditions apply. Sometimes when you purchase more than one type of items online, you can be over-charged for shipping/handling in the Paypal shopping carts - that's one of the Paypal functions are we are still working on improving; but DON'T worry! - WE WILL REFUND the extra shipping/handling charges back to you ASAP (normally within 24 hrs) even without your contacting us. (You may add a text message during check-out to request a S/H partial refund; Please provide a phone # if prefer to be contacted by phone about the refund.) We provide honest products and services and do our best to lower your cost. Home | Policy | Customer Feedback | Contact Us | Copyright © Custom Cables USA LLC, CustomCablesUSA.com, UniversalWeb.com All Rights Reserved.